After this first seminar dedicated to the Chinese sword I thought I could share with you some of my findings. I’m just beginning to understand the power of this fantastic weapon and I still have to train a lot to unveil the richness of it. Since the seminar I train every day for half hour on the particular moves of this new blade. I also tried to understand what some of my friends shared with me from what they learned in Japan since the beginning of this year’s theme. 1. Do NOT train with a Japanese sword (wood or metal) it would not allow you to get the correct feeling on how to move with this weapon. The length is also different, and there is no curve (sori). 2. 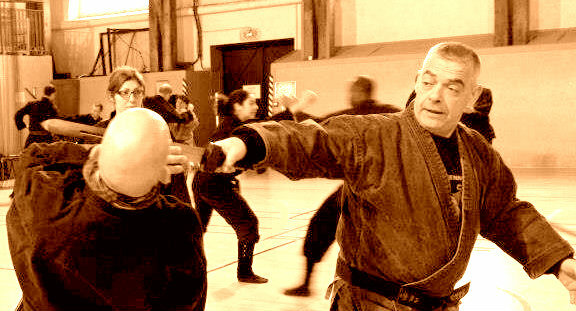 Even though Sensei said there were no kamae nor techniques in Ken, he keeps using a few typical Kamae such as: shizen, hira ichimonji, tôtoku yôshi, ichimonji. Try them they will help your understanding. 3. Body movements similar to the jûji aruki of the Gyokko ryû can be extensively used in order to free the straight blade and create a curved motion. 4. The direction is not important as the blade can hit forward, backward, reverse, even from behind. Stop thinking like a Samurai! this blade was created at least 20 centuries before the katana! 5. The heavy weight of the blade changes totally the way to move the body. It is time to get a flexible body, and to really lower the hips. This is of paramount importance. 6. The blade is “driving” the body, but the body motions free the blade and allows it to “pull” the body. Think of it as a yinyang, magnetic or quantum action: both are nurturing each other. 7. The Ken is the original technique of tachi movements, using these Tachi moves helps you to get close to the proper Ken feeling. 8. Unlike Japanese swords, the Ken is straight and double edged: don’t cut yourself when you put the blade back into the scabbard! 9. The Ken is heavy (more than a regular Japanese sword) so be careful not to hit yourself when doing the furi (it happened to me during training*). 10. The Ken changes easily from one hand to the other like you would a hanbô. Don’t think “sword”, don’t think, move! 11. The Ken like the Tachi is mainly used for stabbing, cutting is not the best choice (straight blade). The stabbing is done with the whole body, often in a kind of Sanshin motion. 12. If you have to cut with the Ken you have to do it with the whole body, like in regular taijutsu. Move your legs! 13. Do NOT think a movement, let the body do it and the blade will get alive. 14. Use the scabbard (it is solid) to dodge the attacks or to help the counter attacks. 15. Train the Sanshin with the Ken. Sensei apparently said that our “Sanshin no Kata” had been designed for this type of Chinese Ken. 16. The Sanshin motion is important when using the Ken. Train the five elements with the Ken. When you do that you will find amazing how those movements get logical with this type of sword. At least I was. 17. Use your forearms to move the heavy blade. Remember this is mainly Katate like the Tachi movements. 18. Use your forearms to support the blade (flat). And keep it close to the body. 19. Keep the sword close to the body whenever possible, for hitting, turning, cutting. I have been training nearly 30 years in the Bujinkan and this new unexpected weapon is like a gift from Sensei. My advice to you is: get a Chinese sword and train hard you will discover a new direction, 方(hô); a new world of possibilities. The Hôken 宝剣 (divine sword) of 2013 IS the real Kenpô 剣法 (fencing), in fact I begin to think that is the true principle of sword fighting, hô no kenpô 法の剣法. Each year Sensei comes with a new theme and each year I feel like a kid at Christmas, but this year with this new sword it is like having a full christmas store (kurimasu ho) クリスマス舗. So? Ho Ho Ho or Hô Hô Hô? *this is a secret if you repeat it I will deny as it is only between you and me. Okay? Next Post Jyanen Or Jian Nen? A question which popped up after your seminar Arnaud: why are we going backward in time with the swords, while to me it would be more logic to study the weapons in the order they appeared in history? This relates also to your point 7. Thank you for the gift!!!!!! I too have been in the Bujinkan nearly 30 years and have trained in some Chinese arts, but the explanation was so thorough and clear. I’m inboard it’s 7am and I just finished practicing the sanshin with my Jo, that’s until I can find a good quality Chinese blade that’s “live” & functional. Domo Arigato. Thank you very much 🙂 having trained for nearly 30 years this is more than heartwarming. It is like coming home, It is very similar to a specific early type viking sword, and I have no doubt reading your post that the fighting style is if not the same then very similar, really looking forward to working with it, and no doubt this will also contain some very relevant points for the yari training, (the type with a straight double edged blade on top). Thank you again for all your wonderful sharing. Hope I can return that favor. This is also the year I started learning the Jian with my sifu. The jian, dao and Katana are all very different weapons. The Jian (ken) is a very difficult weapon to master technically and was originally used for duelling. There is an elegance in using the Jian…..